Red Dead Redemption 2 might not be the usual kind of game people expect from Rockstar, with juvenile jokes and over the top violence taking a backseat to a more measured and detailed approach that offers up a lifelike world unlike anything I’ve ever seen. Thing is… it truly is astonishing in the way that it delivers natural moment-to-moment “emergent” gameplay in a way that really makes you feel like you just don’t know what your next play session might bring you. I could tell you about the time my BFF horse (RIP my dear sweet Lusso) died and I had to make a sad coach trip to Strawberry to go buy a new horse before watching a man literally shoot himself in the foot in front of a tavern and limp off to the doctor (who was out fishing), or I could even tell you about the time I ambushed bounty hunters from above in a ravine leaving no survivors. I could also tell you about the time my horse fell off a cliff when I called her, the time I mistakenly lassoed a women into a fire because my rope got snagged on a chair (see below), or when I thought I was sneaking around in a property like a world-class ninja only to slip on a muddy slope, hit my head and also completely ruin the fancy clothes I wore to appear presentable to the person I was meeting. Heck, I could tell you about the time I hunted this one thing like this, ran into that one guy who said that or had a seemingly random encounter go south when I least expected it – what’s crazy is that it feels like it has an infinite amount of little scripted moments, but then still manages to provide so many more from nothing more than it’s world and gameplay mechanics. 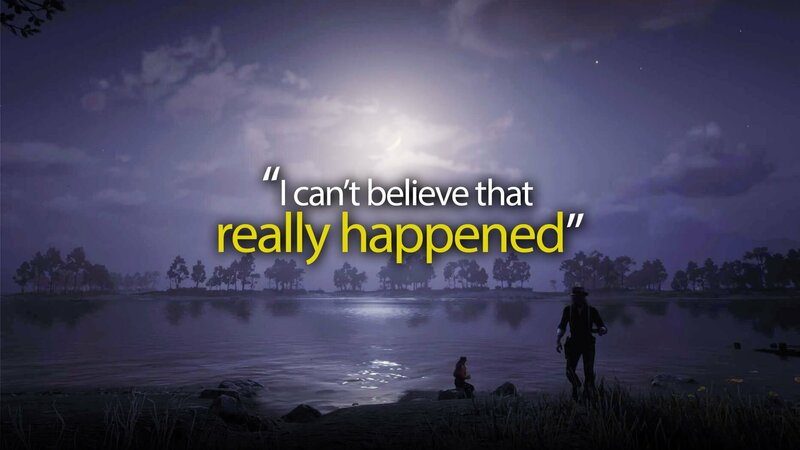 It feels like it’s just all a big part of the main story, and that’s something else – constantly leaving you thinking, “man… I can’t believe that really happened”. I’m sure that videos like Kotaku’s Highlight Reels are gonna find a bunch of real winners. I can’t wait to jump onto my message groups every day and tell my friends about the unique little experiences I’ve had, and I’m even more excited to sit around with them over drinks in the near future to hear their stories and compare notes. This game is big, and if you factor in nothing but scripted content it’s already mind-boggling how much there is. The game that has been designed is borderline voodoo in its level of detail, but the hilarious or interesting little moments that naturally occur in between is what makes me believe that this game is truly something quite special. I feel like if you journaled your game sessions, and added a bit of creative flair you could legitimately write a storybook on the adventures of Arthur Morgan that was unique to just you. I can’t wait to hear other people’s stories, and see what happens next. Keep an eye out for our review soon, although by now I think it’s pretty clear we think you should buy it.